You are currently browsing articles tagged black flowers. Tulips are one of the truer black flowers. 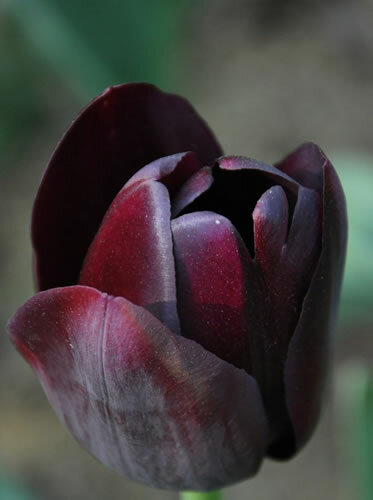 Queen of night is purpley tulip that appears almost black. They are mainly available in winter and spring. Tulips look fabulous as compact bridal bouquets. Cymbidium orchids and slipper orchids are available in black. They are a very deep shade of red. 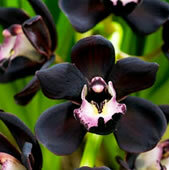 They are the most expensive black flower in my top ten list, as they are rare and only available as a special order. Cosmos looks a little like a single dahlia. It is a delicate flower with a scrumptious vanilla and chocolate fragrance. 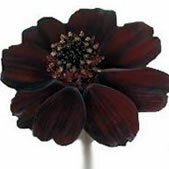 The flowers have a chocolaty red tone and are available in summer. 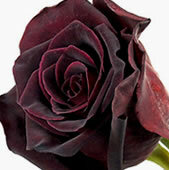 There are several black roses including black baccara and black beauty. Black baccara is sumptuous deep red rose, and like all roses, it’s available all year round. 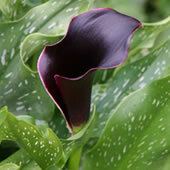 Black forest callas are my number one black flower. They are very glamorous and structural. 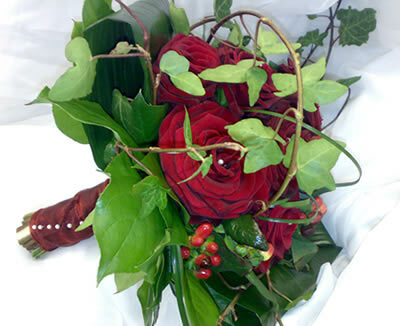 Callas are available all year round, which makes them ideal for weddings. They are lovely in bridal bouquets. 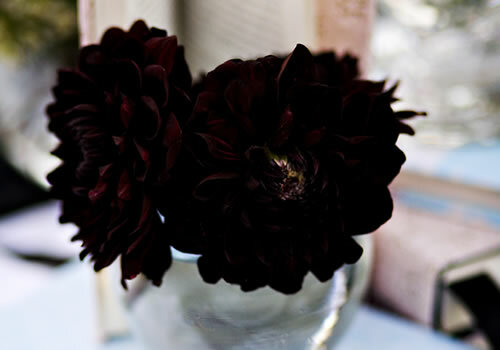 Black is the elusive colour for flowers, we don’t really have any true black flowers. There are many varieties of flower called black, like black beauty rose and black forest calla lily, but they are really a very deep purple or red. Dark colours recede, so when you look at them from a distance they appear to move away and look darker. Care should be taken when using a few dark flowers with lighter colours, as a single purple flower can often look like a hole in a design if used with paler flowers. 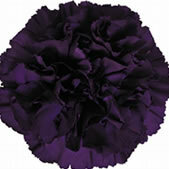 Dark purple flowers have an intriguing, inky black quality and deep red flowers are luxurious and velvety. Flowers use their colour to attract insects to pollinate them that is why darker flowers are rarer in nature. The flowers in my list are all available as cut flowers, but they are not the kind of flowers you will find if you just pop into your florist. A florist may have the odd black flower in stock but generally they are ordered in. These pretty summer flowers are traditionally blue, but the black variety is very striking. 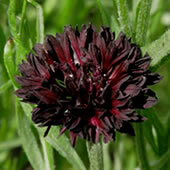 ‘black ball’ is a very deep red with hints of chocolate. 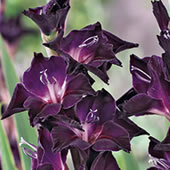 Most black flowers are either dark red or purple, gladioli come in both colours. They have fabulous long stems up to a metre long, perfect for big vases or pedestal arrangements. These delicate flowers are available in a very dark red or purple. They have short stems as cut flowers, but they are perfect for wedding work. 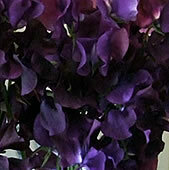 Sweet Peas have a fabulous scent and are available from March to November. Carnations are great value for money and available all year round. They are the cheapest black flower in my top ten list. They are ideal to fill out arrangements or work well used on their own in compact designs. Moon vista is a lovely deep purple with a velvety sheen. 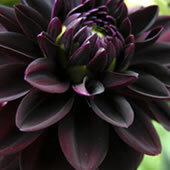 Black dahlias are a gorgeous shade of deep red. Their symmetrical petals are exquisite in this velvety shade. They are available from June to October. The top five black flowers will follow tomorrow. 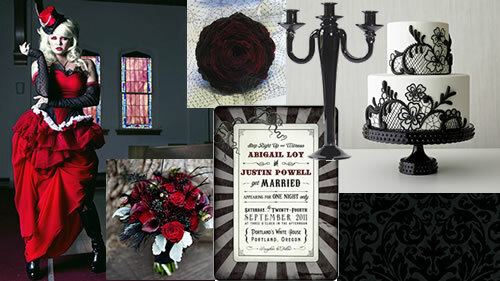 I’ve put together some ideas to give your gothic wedding a dramatic and mysterious style, based around a colour scheme of reds and black. Picking a suitable venue will help you achieve a gothic look more easily; Victorian buildings or medieval castles are perfect. If you can’t find a gothic venue that’s within budget don’t panic, there are plenty of things you can do to transform a venue into a gothic masterpiece. Lighting plays a big part for gothic weddings; low light with candles will help create the right ambience. You can really go to town dressing your tables for a gothic theme. You might want to book the services of a venue dressing company or event planner to provide most of the items as they will be able to hire them to you. To dress your tables, hire black cloths and team with red and black accessories. Linen companies can provide baroque print table cloths like the one on the mood board, the fabric gives a luxurious opulent feel. For your centrepieces you could use black candelabras with Ivy wrapped around the arms. Or for floral centrepieces stack some vintage horror books on the table and place a collection of apothecary bottles on them, place single flowers in the bottles in black, deep reds and purples. You can’t really get a true black flower but some purple and red flowers are so dark they appear black so they are named as black. Deep red flowers include black dahlias, black baccara roses, and chocolate cosmos which are a velvety red/chocolate colour. 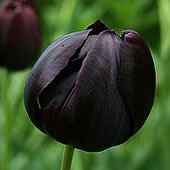 Dark purple flowers include schwarzwälder or black forest calla lily, queen of the night tulip and moonvista carnation. Use red charger plates, black napkins and ornate goblets to continue the theme. Calligraphy is perfect for a gothic look so have your place cards written by a calligraphist. Miniature potion or apothecary bottles would work well for favours. 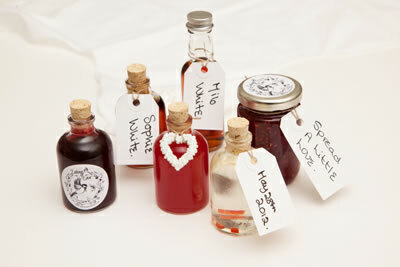 If you want to make your own favours make some sloe gin and decant into bottles with personalised labels.